There are also strong links between our work on post-war reconstruction and the themes of conservation, design and form. Work on various aspects of urban character, quality and form has been undertaken for the Royal Town Planning Institute, the Seoul Development Institute, Birmingham City Council and Stratford upon Avon District Council. The Stratford work was formally adopted as Supplementary Planning Guidance. 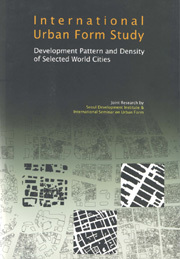 The International Urban Form Study was commissioned by the Seoul Development Institute and coordinated through ISUF (the International Seminar on Urban Form). It identified a series of 'world cities', within which broadly comparable 500m x 500m grid squares were studied in detail. The cities were Seoul, Tokyo, London, Paris, New York and Los Angeles. Peter Larkham undertook the London study. Work on urban form has benefitted from strong links with ISUF. Peter Larkham is Associate Editor of its refereed journal Urban Morphology. There are also strong links with the Urban Morphology Research Group at the University of Birmingham, where both Peter Larkham and Nick Morton obtained their PhDs. Both have published jointly with Professor J.W.R. Whitehand, the most prominent figure in UK urban morphology, who is also a Visiting Professor attached to this Research Centre. Peter Larkham co-authored the Glossary of Urban Form, still a useful resource, and by courtesy of the Royal Geographical Society/Institute of British Geographers it is now available electronically. Peter also wrote a substantial overview paper on 'The study of urban form in Great Britain' for Urban Morphology. We are interested in developing further collaborative ventures and projects in this broad area.